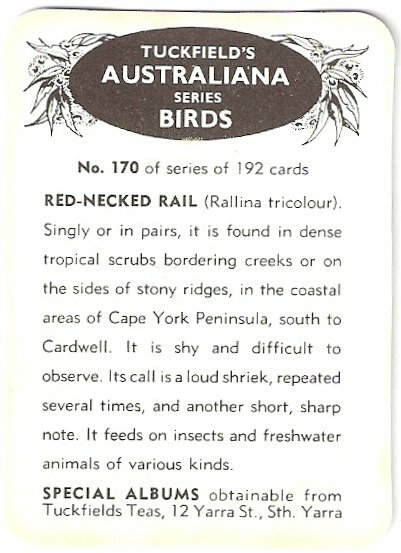 This is the Tuckfield's type "Y" card with the "of series of 192 cards" and the unusual "Special Albums obtainable ..." clause. There are several things that make this card unusual. as far as I know, this card was never issued in the tea, at least not visibly. I have only ever seen this back underneath either style blue back issue, the type "W" card or the type "X" card. Why is it underneath, I have no idea. The graphic is the same, the words are identical and the blurb on the bottom matches the "X" card. What also makes this card unusual is that it is only part of a 64 card subset and the only other variation to say "...obtainable..." is the "X" card.